* crafting......: UI freezed while working at some Crafting Station (as suggested by Baertram). - UI freezed while working at some Crafting Station (as suggested by Baertram). - Tracking potions with same slotId .. promoted to a "known issue"
- New "NO SOUND ENTRY"
- New slash-command. : /gqsb clear ...to clear Current-Preset-Items. - New option: Auto-Clone previous-to-empty preset (ON OFF) ...whether to copy the CURRENT PRESET LAYOUT AND CONTENT when selecting an EMPTY PRESET. - Addon-Version added into the Settings Menu Display Name. Collectible Presets properly saved and restored. Collectible tooltip active state missing (Found no sync capable EVENT_XXX). LibAddonMenu empty panel issue: could not find any workaround. - lib author wont consider his buttons should not be the only means to change addon settings. - Found no way to avoid this side-effect when I need to refresh Per Preset Settings Panel UI. - workaround: use the cog to the right of the Addon UI. - Each preset saves and restores its own Quick Slot Items Set. - A new BIG TOOLTIP stating you have to click the red-pin when the Addon-UI is UNLOCKED during layout. - IMPORTANT NOTE ABOUT "EXCESSIVE MESSAGE WARNING"
* Item swap adds up in the count of message spamming. * If you get this warning, be sure to wait a few seconds before your next preset swap.
. it is added to the Quick slot bar when it is missing.
. This may happen when some pre-selected items are not available when a particular PRESET is activated.
. As adding items missing from the BAG_BACKPACK is not supported, it must be done when available.
. Access a BAG_BACKPACK [slotID] item name.
. preserving whatever is slotted in the Quick Bar at that time.
. capture current Quick Slot Bar content into an empty PRESET before SAVING OR USING it.
. Clears a Quick Slot Bar entry based on intentionally-left-empty PRESET slot.
. Equip a Quick Slot Bar entry based on an configured PRESET slot.
. Save the item added to a Quick Slot Bar entry.
. save all current Quick Slot Bar entries to update the Addon UI.
. Search the BAG_BACKPACK to get the Item ID passed to equip_bNum_item_slotId.
. get information about currently EQUIPPED or SAVED item name. - added the missing GreymindQuickSlotBar.xml Thanks Thrasher who spotted this one! - API 100008 compatible (140804). - API 100007 compatible (140625). - "Disable Default Quick Slot" option is more responsive to UI transitions. ...and when this option is OFF, this Add-On will neither Show nor Hide this button and let the game or any other Add-On in charge with no interference. - Correction to next/previous slot key binding which missed the last entry. - Search for "Auto-select next not empty slot" wraps to check all entries. - PATCHED LibAddonMenu so that Settings menu follows Preset swapping. - "Disable Default Quick Slot" option enforced by Reticle change instead of when addon UI needs a refresh. - TODO: turn this option into a 3-ways Dropdown: OFF/ON/IGNORE to let other addons take control. - ADDED - Visibility Option "Always"
. Using a Keybind or reorganzing Quick Slot Wheel will show the UI unless Visibility "Never" is selected.
. then, Combat or Reticle reticle control will be restored.
. Visibility "Never" having no coded control, ForceVisibility will be the only means of action. - Quantity Alert and Warning sliders lock issue solved. - API 100004 compatible (140523). - UI handles: Lock-unlock-pin, Preset x 5, Settings menu. - Settings menu is updated with a new set of parameters at each change of the current Preset. - Option to automatically select the next not empty slot when the current slot items are consumed. - Reordered the 8 slots numbering so that 1-8 grid slots turn clockwise starting from 12 o'clock. - Settings option menu items reordered so that most useful entries come near the top. - Every settings change is effective immediately (reloadUI is never required). - Options to anchor text to 5 horizontal and 5 vertical positions. (3 inside, 2 outside). - Opacity and gray-out adjustable options. - Added color indicator for quantity label and key bind label if item quantity is 0. - Prevent key labels showing 0 on empty slots. - Fixed and improved auto-hide behavior. Can now use and click in "mouse mode" if not in UI menus or conversation. - Revamped settings menu with subheaders, a dash of color and sliders for numeric inputs. - Added feature and setting to disable default quick slot action button provided by the game. - Added feature and setting to control the opacity/translucency of slot items that are not currently selected. - Can display item quantity and set position (horizontal and vertical) relative to quick slot items. - Can force quick bar to show via a hotkey. This overrides all your other settings until its turned off by pressing the key again. - Can resize expanded bar to display as grids or purely vertical/horizontal strips (default). This also lets you only show a limited number of quick slots if you so desire. - Keybinds to move to previous item or next item. Intelligently skips empty slots. - Added auto-hide feature when in combat. - More positioning options for keybind display label. - Shows currently selected quick slot item with a colored label and all others with some translucency. 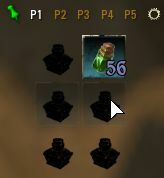 - Can now adjust the size of the quick slot items. - Added ability to lock UI to prevent resizing or moving. - Updated the LAM addon, even though I don't benefit from the changes, its the right thing to do since other addons might source it via LibStub. - Key bind display and position (above/middle/below) for each quick slot item! - Now properly redraws the quick bar after wayshrining and traveling to player. - Ability to turn on/off the base background for the expanded quick slot bar. - Added a new background to each quick slot item + settings to toggle this. - Added visual cues based on two values (warnings, default 10 and errors, default 2) + settings to toggle and set these values. - Added smart visual cue toggle that shows visual cues only when there's something to report. - Can now move UI with and without background enabled and by clicking and dragging all areas around the slot items. - New border graphic added to match ability bar. - Settings now saved across characters! - Added toggle-able auto-hide feature that hides when in UI mode. Can still reposition in settings screen or with auto-hide off. The issue persists, so I had to do exactly what you said, turn off Account Wide Settings. It works now. Last edited by ivanwfr : 04/05/19 at 10:28 AM. Well, it could be we're lucky enough for the last version may solve the issue. In fact, I can't make the first step as long as it seems to do the right thing when I swap my chars. Make sure you don't check the "Account wide Settings" first option (it's a new one since v2.4.5). Last edited by Galadius : 04/05/19 at 10:00 AM. 4. are the icons for Player1 as are the tooltips. 7. , but nothing will change in your addons GUI. I'm looking into this right now! In the meantime, would you tell me which version you are using. I am not sure this was the same thing noticed by another poster, so I apologize if I duplicate what I believe to be an issue. When I log out from Player1 then log into Player2, the items in the G Quickslot Addon bar are the icons for Player1 as are the tooltips. I can use the keybinds I created and select what IS there for Player2, and the item that is actually slotted will appear in the Default Quickslot, but nothing will change in your addons GUI. 1) I install Static's Quickslot Profiles (which has slash commands) and utilize Harven's Aliases. 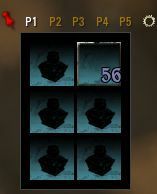 2) I open the Quickslot section of my Inventory, and pick up and put back each item slotted in the circular GUI. Either of these has to be done anytime I swap toons. Last edited by Galadius : 04/05/19 at 07:43 AM. What was handled was only about NOT SHOWING the addon window while crafting. What was missing was hiding it when it was displayed when crafting started. That was not wrong but that was not right either! Now, it should work as it should have. is there a way to prevent appearance of this addon at craftng stations? This should be solved since version v2.4.4, as stated in the Change Log. You can check your installed version from the Settings panel or with the slash command /gqsb. BTW, you can install the next version early: v2.4.6 release candidate from GitHub. Last edited by ivanwfr : 04/03/19 at 04:57 PM. Last edited by ivanwfr : 03/04/19 at 04:41 PM. User Interface showing a big red X when LOCK IS OFF.. instead of hiding slotted items. I am noticing a glitch or perhaps a bug. 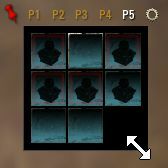 When I switch from P1 to P2 then back, items in P1 are no longer in the top three slots and I have to put them back in. It happens every time. In fact, when I set them up, I'm not sure what happened but now my main bar is P1 and I haven't been able to get it back to the default. I'm using it as is and am glad for the extra bars to easily access items I need. It looks like something Onigar reported below 2 weeks ago and I tried to look into it. But I still have to see this happening to me. It's why I haven't released the last GitHub version.